Germany has the fifth largest economy in the world and is often known as the economic engine of Europe. Despite the scale and diversity of the German economy, it has a common and very well defined business culture. It is one in which blending in can prove beneficial in your business endeavors with the Germans, as well as for finding a job. 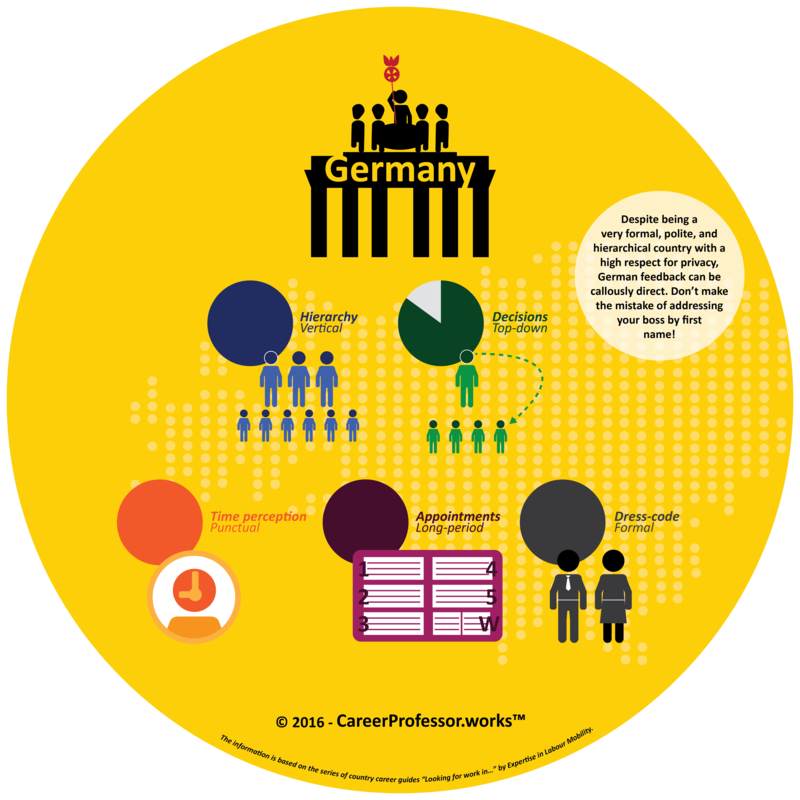 This CareerProfessor.works infographic offers the core of the German work culture.Click here for a legend of the infographic. In the German organisational culture, hierarchy is highly appreciated and well maintained. 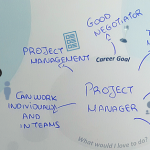 Organisations tend to have a strong management, in which the highest positions are held by a small group of the most experienced and/or qualified people. With a distinction between functions, employees are expected to do what they are told. Not surprisingly, the communication style is often done in formal fashion, notably by the use of ‘’Sie’’, the formal second person address. However, nowadays the company provides surveys to gauge the needs and satisfaction of their employees. As the hierarchical culture dictates, the decisions are taken top-down, in which the decisions by the chairman are always respected. Procedures and rules are closely adhered to, and although it tends to make the decision-making process quite lengthy, it is usually associated with commitment and professionalism, in which rushed decisions are associated with a lack of such attributes. Also, Germans are born perfectionists and even the smallest details of a particular issue will be covered during meetings. Punctuality and efficiency are paramount in the German conception of time. Meetings usually do not take longer than scheduled, often because there is another meeting planned right after. Long-time planning is very common in the German organizational culture. Germans plan ahead, therefore most appointments and meetings are scheduled weeks in advance. However, it may occur that traffic keeps you from being on time. In that case, call in to mention that you will be late, or otherwise be ready to provide a very good reason. The appropriate business attire in Germany is relatively conservative, yet formal and elegant. Men often wear neat dark coloured suits, whereas women either wear dresses with jackets, suits with skirts, or trousers with tights (also during summer). While contemporary business ethics do allow for a more casual approach depending on the company, dress-code ought to be taken into account when doing business with Germans. Have you already read about the work culture in China?